We live in the age of technology. Nothing proves this more clearly than our television viewing habits. Nobody subscribes to the TV Guide magazines of yesteryear or waits for their favorite program on Thursday night. Streaming and binge watching online is the norm. If you do still have a cable or satellite connection, sports might be the only thing viewed at the time actually aired. We are guilty of chasing this immediate gratification. We access a few streaming services and have several favorites from the networks that are dutifully recorded. When we have time to relax we pull up a recording, and the current schedule seldom gets a glance. The only exception is Downton Abbey on SDPB, and with its last episode airing Sunday, even this is coming to an end. However, tonight there will be another exception for our television viewing. We will tune in to the Food Network at 9 p.m. Central, 8 p.m. Mountain, for Beat Bobby Flay. While this isn’t on our regular rotation of programs, it is a must for us to see this particular episode in which Sanaa Abourezk, one of South Dakota’s favorite chefs, is competing. I met Sanaa online through Twitter many years ago. Social media was in its infancy, and someone had told me it could be good for my blog. I searched out a few people across the state who seemed to have similar interests, and Sanaa made the cut. More importantly, the chef, restaurant owner, cookbook author and blogger interacted. She offered cooking advice when asked, chatted about the weather, shared a love of sushi and laughed at my corny jokes. When I first made my way to her Sioux Falls restaurant, Sanaa’s 8th Street Gourmet, not only did she treat me to delicious Mediterranean foods that I had never tasted, she took time out of her busy day to sit and visit with me while I ate and sent me away with special treats. It was clear that she loves to share her knowledge and incredible food, and also that I could count on Sanaa as a real friend. So tonight, thanks to the age of technology, I will cheer on this friend from the comfort of my sofa. No matter the outcome, I will feel that Sanaa is the winner. Her cookbooks, cooking classes, restaurant and her blog are all rich with her profound passion for good food and sharing a good life here in South Dakota. Tabbouleh is one of my favorite offerings at Sanaa’s 8th Street Gourmet. I recreate it often in the summer with parsley from my garden and savor its bright, fresh flavors with hummus and pitas. 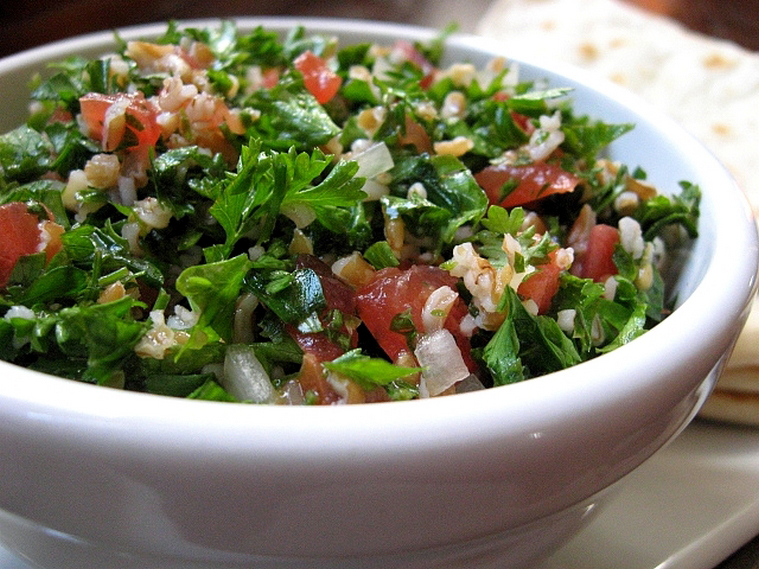 Tabbouleh can be served in a pita or as a side salad. Add the bulgur wheat; stir. Cover and simmer for 12-15 minutes, or until tender. In a salad bowl, combine the cooked bulgur with the tomatoes, onion and parsley. Women where I live now (Palestine) like to serve huge quantities of tabbouleh in their afternoon gatherings. This means lots and lots of flat leaf parsley. The taste of curly leaf parsley is too sharp for this. This is a wonderful, refreshing, and very nutritious food!